Dame Sarah Storey and Jody Cundy set world records to take Great Britain's gold tally to four at the Para-cycling Track World Championships. 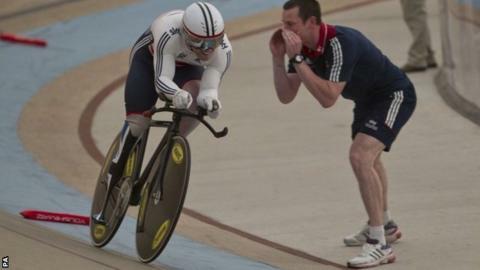 Storey broke her own world record in winning the C5 pursuit, while Cundy won the C4 kilo, his ninth world title. "Today has been fantastic," Storey, 36, told BBC Sport. Jon-Allan Butterworth won silver in the C5 kilo, giving GB seven medals going into Sunday's final day of competition in Aguascalientes, Mexico. Sophie Thornhill and pilot Rachel James, and Neil Fachie and Pete Mitchell, won gold in the women's and men's kilo time-trial respectively on Friday. Storey is competing in her first major international event since giving birth to daughter Louisa last June. She took more than a tenth of a second off her record of three minutes 32.170 seconds - set at the London 2012 Paralympics - in qualifying for the final in 3:32.050. She beat Poland's Anna Harkowska in the final to claim gold, catching her opponent with six of the 12 laps to spare. Storey, who won C5 pursuit bronze on first day of the competition, added: "It's been great to get back to the winning form I was enjoying at London 2012 and to go that little bit quicker than London in the morning was just the icing on the cake." Cundy, who was disqualified on the start line of the kilo at London 2012, took 3.678 seconds off his world record in clocking 1:01.466. The 35-year-old said: "World records can be broken, but it's nice to put one out there that should hopefully stand for quite a few years." Spain's Alfonso Cabello broke Butterworth's world record in beating the Briton to gold in the C5 kilo.